Posted on May 23, 2015 by thelostlighthouse	in Gaming and tagged Arkham Knight, Batman, Batman: Arkham Knight, comics, DC, DC comics, gaming, Godzilla, London Comic Con, MCM Comic Con, MCM Comic Con 2015, musou, Namco Bandai, Omega Force, One Piece, One Piece Pirate Warriors 3, Pirate Warriors 3, PS3, PS4, Rocksteady, Sci-Fi, Sony, Tecmo Koei, The Lost Lighthouse, TLL, tllgaming, video games. Adam headed off to the MCM Comic Con Expo in London this weekend. This is what he saw. As part of my first day at London MCM Comic Con this year, aside from some general wandering around (first impressions here!) I checked out a few of the video games on offer, focussing on some upcoming games that I’ve been looking forward to (some of which I had forgotten about until I saw the demos). Here are some thoughts on three of my favourites. 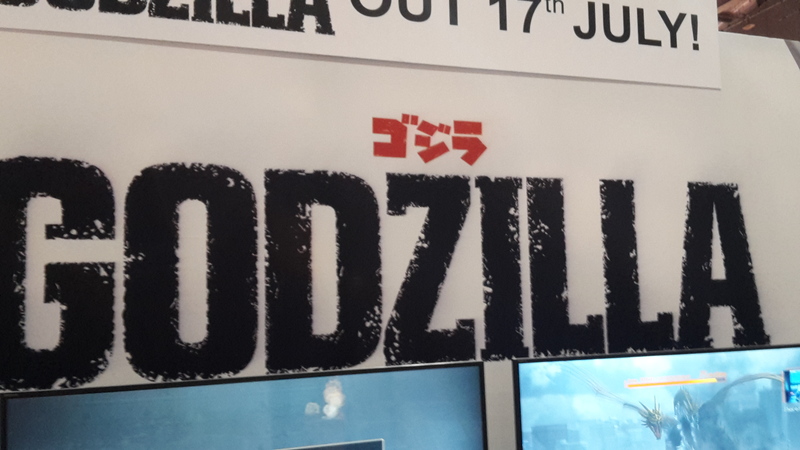 As you can just about see there, Godzilla is a Namco Bandai game already out in Japan for PS3 and PS4, but over here it isn’t being released until July 2015. Playing as Godzilla, I destroyed some buildings while being attacked by the army, with the aim (I think) of blowing up some generators and gradually growing in size. In my way were two other kaiju – King Ghidorah and Space Godzilla (like Godzilla, but from space) that I had to scrap with in an arena. I took out King Ghidorah while he was trying to deal with some giant stalagmites created by Space Godzilla, then melted the latter’s face with some multiple nuclear breaths. Apparently I also successfully destroyed the area. It was 100% more fun than last year’s film. The short Godzilla demo I played was at it’s core a very fun, if simple and easy game. Not that there is anything wrong with that, not everything needs to be Bloodborne and gaming would be exhausting if it was. Tonally it was much more in line with the classic Japanese films, tongue in cheeky rather than oppressively dour, unsurprising as it was made by Namco Bandai rather than a Western studio. The controls were quite basic and to be honest, fairly clunky and sluggish. 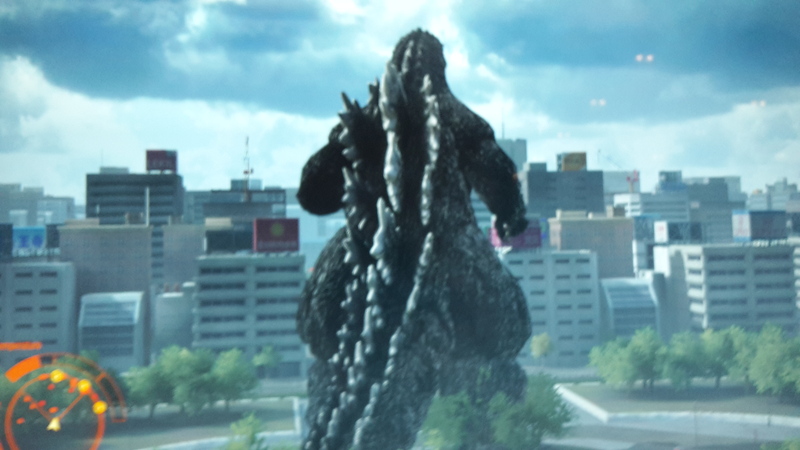 But admittedly, having the King of the Monsters moving in a quick, smooth way wouldn’t look or feel quite right. So despite that, I’d be interested in seeing what the whole game is like. 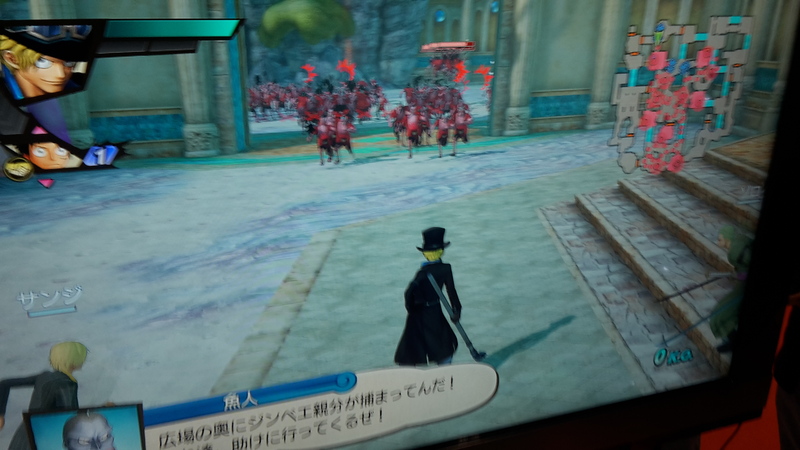 Pirate Warriors 3, developed by Omega Force and published by Namco Bandai and Tecmo Koei again, is the latest instalment in the One Piece musou games (Dynasty Warriors style 1 vs. loads of enemies). I really like the One Piece world, and the powers of Monkey D. Luffy, his crew and the variety of interesting allies and enemies are perfectly set up for this sort of game. The levels typically involve hundreds of weak pirates or navy infantry for you to smash or hack through, followed by some big boss. It is basically button bashing fun, and the demo for the third entry in the series was no different. A few new elements here (aside from even more characters added to the already huge cast) involved some of the more recent story from the anime and manga, including Fishman Island and Dressrosa, and the new team attack (apparently called Kizuna Rush) that uses multiple finishing moves from your companions at the same time in a massively damaging combination attack. It looks insane and is a ton of fun. 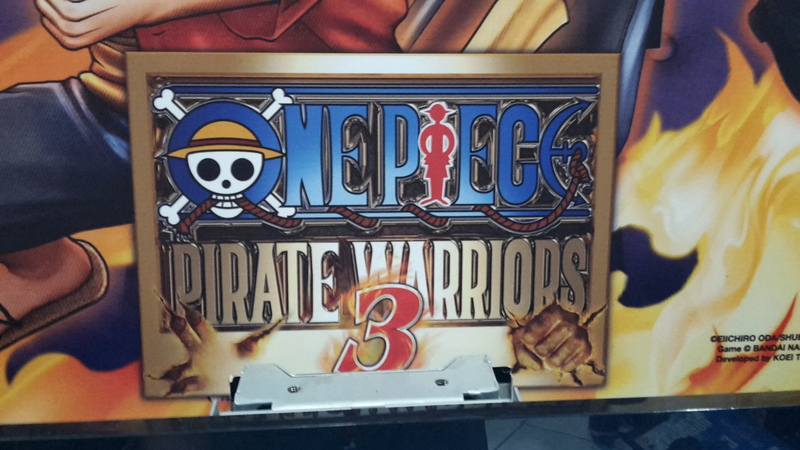 Pirate Warriors 3 is already out in Japan, but is everywhere else in August on PS3, PS4, Vita and apparently PC too. Finally, I queued for about 10 minutes to watch some Batman: Arkham Knight footage. We were filed in to a stiflingly hot room and a screen of about 10-15 minutes of gameplay was shown to us, with one of the attendants doing a pretty solid job of narrating. For some reason, despite the game coming out next month and so hopefully finished by now, they weren’t offering demos to actually give the game a try. I wasn’t too bothered about this though, as having played 3 full Arkham games already I know what to expect – more of the same, with some new extras, better controls and improved graphics. I wasn’t totally enamoured by Arkham Origins. It was fine, but it ultimately felt like a bit of a cash grab to me. The story wasn’t bad, but elements of the game felt inherently ridiculous (executioner gloves), the sandbox you played it seemed largely unchanged and some parts were just re-skins of assets from Arkham City (glue grenades, really?). I felt like it was a fine game from WB Montreal, but I consider Asylum and City to be from Rocksteady to be great games. 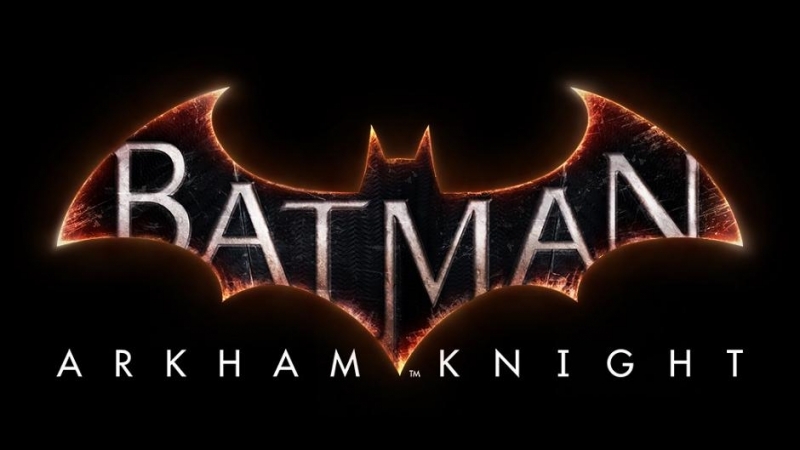 I feel like if we hadn’t had a new Batman game since Arkham City in 2011 then general excitement, at least speaking for myself, would be much higher. And maybe rushing out an average game damages the brand somewhat. That being said, I really loved Arkham Asylum and Arkham City. The attention to detail with regards to Batman and his rogues shows a great love of the source material, and when they use ‘Be the Batman’ in promotional material it really is because the free flowing combat has been honed to the point where, aside from donning a cape and risking your life every night, it really does feel like the closest thing to being the caped crusader every time you slo-mo smash someone’s face into the wall at the end of a fight. In the footage we were shown, some of which was for the first time, the mysterious Arkham Knight (supported by the Scarecrow) has occupied Ace Chemicals. Batman glides in and wrecks some thugs with the impressive new ‘fear takedown’ that allows you to chain takedowns after sneaking up on foes, before opening the gate and remote calling in the Batmobile (check out the full size Batmobile they had at the event at the top of the article! ), seamlessly jumping in as it enters. Throughout the screening we were shown a few more fights that showed off improvements to the combat, and some battles between the Batmobile and unmanned drone tanks controlled by the Arkham Knight. We also saw an assisted takedown carried out by Batman throwing a thug up in the air and having the Batmobile take them out with a stun shot. It was pretty rad. As far as storyline goes, little was given away other than the fact that the Arkham Knight has a serious hate on for Batman, and wants him dead before the end of the night. I’ve a few guesses for who it might be, and while I’m expecting a twist I really hope it isn’t something that involves the Joker. Please. Arkham Knight is out on the 23rd of June, and I’ll be picking it up on release and reviewing it to avoid some work I’m pretty sure I should be doing that week. I played a few more games, but Comic Con (as you can probably guess from the name) isn’t primarily a games convention so it wasn’t exactly a focus. I’ll be back with more articles tomorrow on what I checked out on Saturday. London MCM Comic Con is open until Sunday, so if you’ve been thinking about it come on down to the Excel centre for some geeky goodness either today or tomorrow! I’ll be the one wearing the nerdy t-shirt.